Strachan Point is the perfect rural ocean escape, just minutes by highway from the North Shore and downtown Vancouver BC! 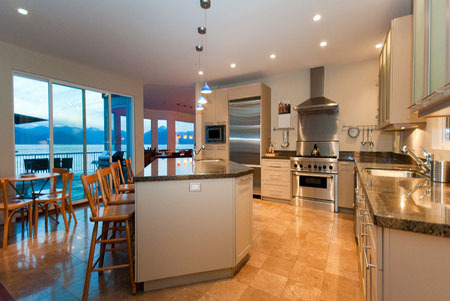 This open plan waterfront home is located just north of Vancouver's Horseshoe Bay in the upscale residential area of Lions Bay. 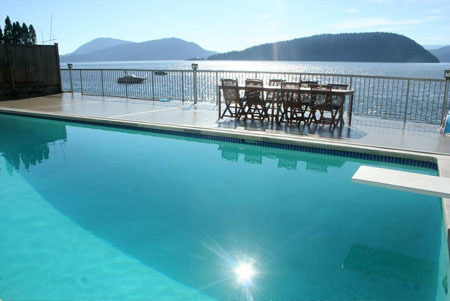 Strachan Point is situated directly on Howe Sound, one of Canada's most beautiful ocean inlets. 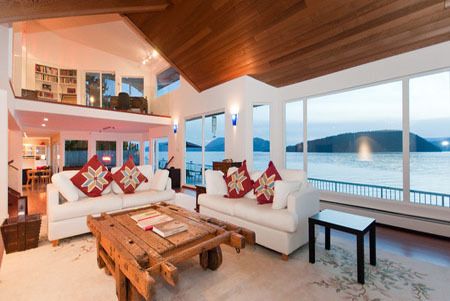 Thanks to this spectacular setting, the home boasts expansive ocean views from every room. 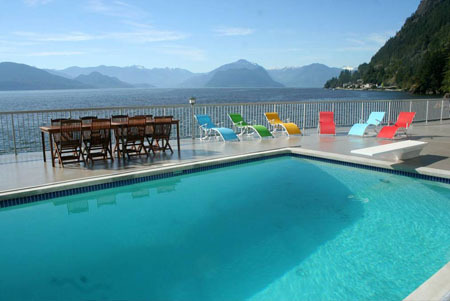 As Strachan Point is just off Highway 99, which runs between North Vancouver and Whistler BC. 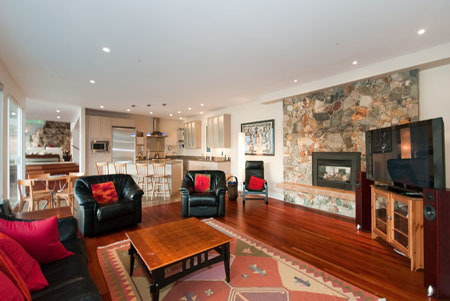 You have easy driving access to all of the world class attractions, restaurants and shopping of Vancouver and you are also less than an hour from the mountain playground resort village of Whistler BC. 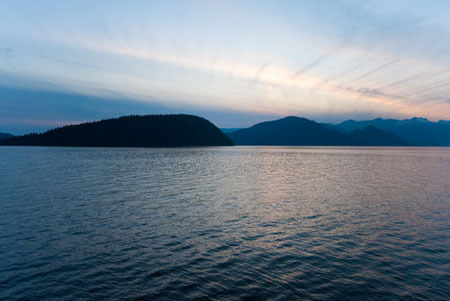 If you are looking to stay closer to home, Strachan Point is minutes from the diverse recreational areas of Cypress, Seymour and Grouse Mountains and Fury Creek Golf Course is just a short drive to the north. Picture yourself spending the ultimate West Coast day. Skiing in the morning, golf in the afternoon and dinner, outside by the ocean. 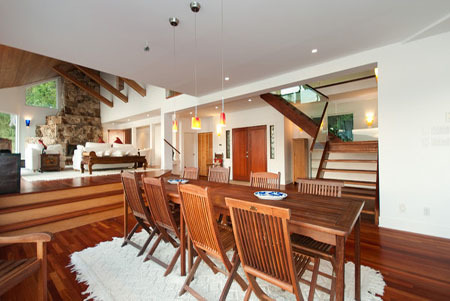 As you pass into this private, gated property, you are immediately taken by the natural setting. 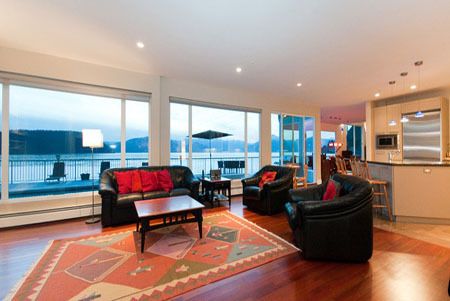 This home is in complete harmony with its waterfront environment. 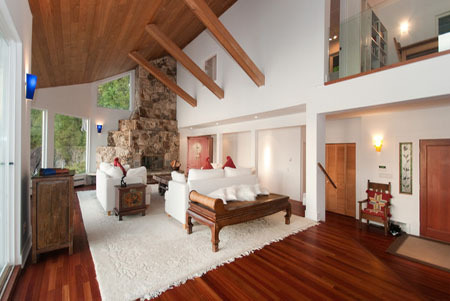 As you enter, you are immediately impressed by the wide-open design. 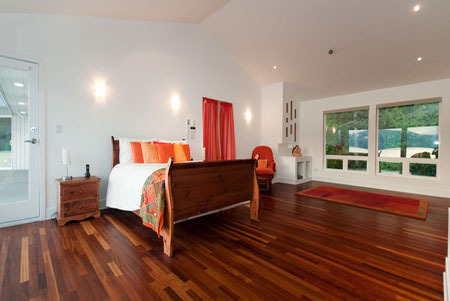 Brazilian cherry wood and heated limestone floors lend a rich, warm atmosphere to the living and sleeping spaces. 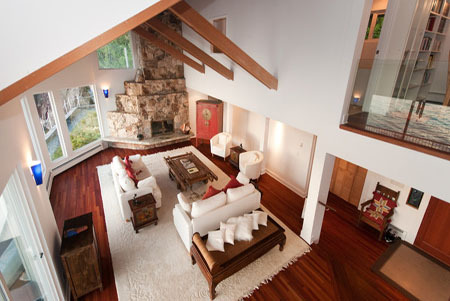 Floor to ceiling windows provide endless mountain and water views from nearly every room in the house. Enjoy the views of the ocean and pool while eating at the kitchen bar seating or at the dining table. 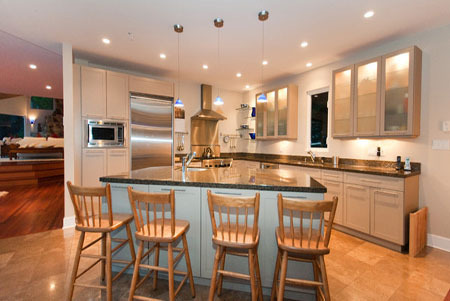 The kitchen features everything a chef might desire including a Thermador 6-burner gas range, steaming hot water tap, granite counter tops and top of the line stainless steel appliances. 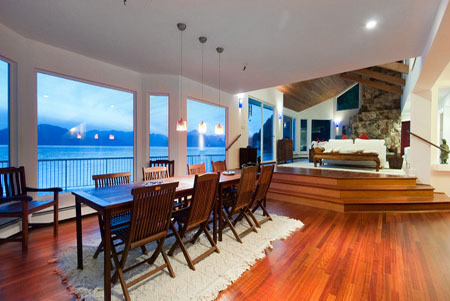 The living room is raised from the main floor and has large windows and views to the ocean. It's grand appeal is punctuated by a large rock wood burning fireplace, perfect for setting the mood while watching the sunset. The family room off the kitchen features one of the three fireplaces in the home as well as the sauna, which is off the pool area, and a 50 inch flat screen television. 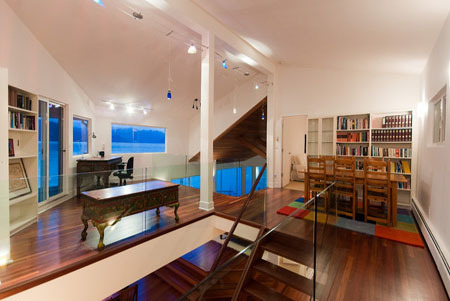 To stay in touch with business, there is an office on the main floor complete with wood burning fireplace. 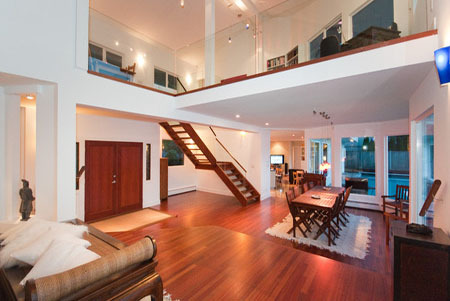 The upstairs living spaces all offer unobstructed views of the ocean. 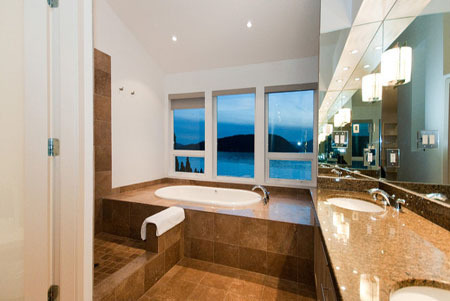 The Master bedroom has a large ensuite bathroom with two sinks and a large jetted Jacuzzi tub. 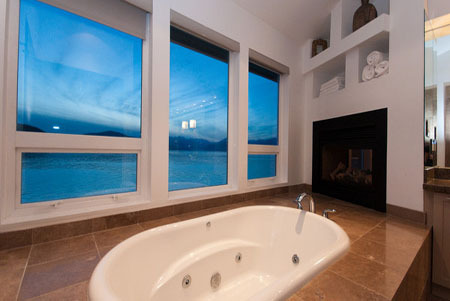 Be sure to relax there, warmed by one the home's three gas fireplaces, while taking in a spectacular sunset and watching eagles fly overhead or seals swimming by. Step out onto the 2rd floor veranda to survey the pool deck and the water beyond, you will feel like you are looking out from the deck of an ocean liner. 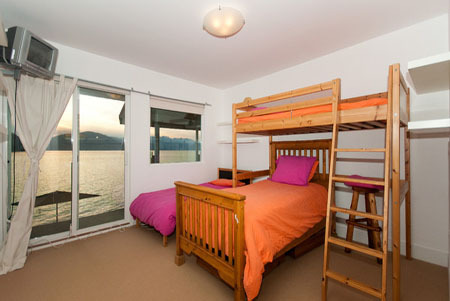 The third bedroom has a bunk bed and twin bed. 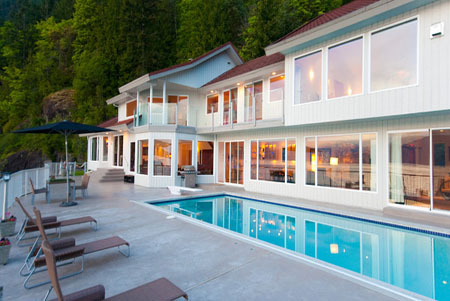 The ocean side of the house has a 42 x 16 foot pool adjacent to the water with a small lawn area and steps down to the water's edge. There is a sauna off the family room and pool change room as well. 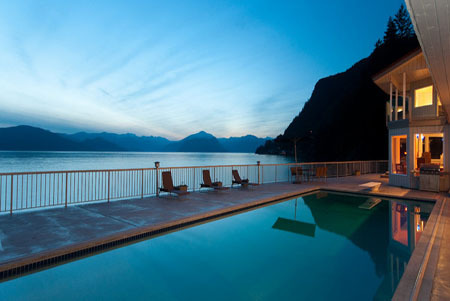 Strachan Point is truly your very own oceanfront resort and is ideally situated to experience everything Southern BC has to offer. - Better directions to the house. The website directions were terrible - it made no sense at all and we got extremely lost. - Spray the house for mosquitos - there were lots of mosquitos in the house - we all walked away with multiple mosquito bites. - Add a stereo or way of listening to music in the house. - Provide better cookware - cast iron skillet, better sized skillets, pans. 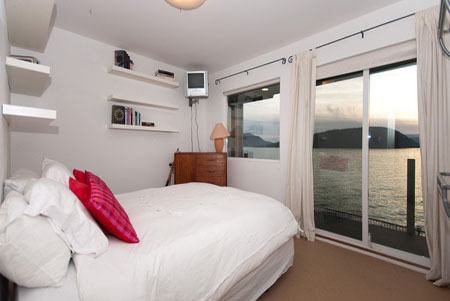 However, we overall really loved the view and enjoyed the house itself. 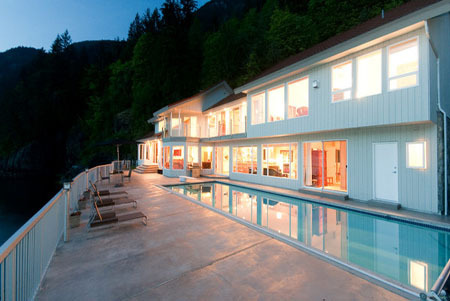 Great view, beautiful home. 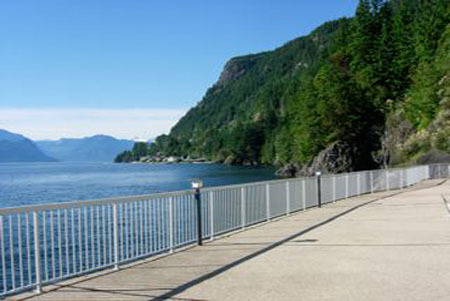 Location is a bit remote for basic supplies but quick access to Stanley Park. Couldn't beat the deck and and overall tranquility. 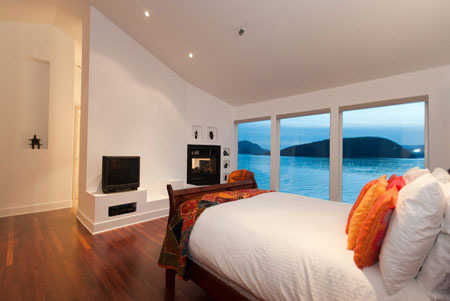 Our short stay at the Strachan Point was generally enjoyable. The view from the backyard and the pool area was fascinating and breath taking! 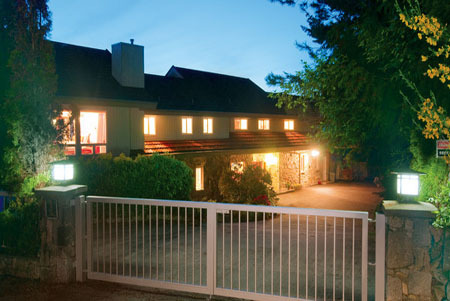 The property was spacious and the weather was very warm and pleasant. The kitchen was well equipped with all the necessary tools. The place was reasonably clean. The main disappointment was the pool. It was frigid cold! The pool was very cold throughout our stay. We were not able to use it in the five days we were there even though the weather was unexpectedly warm. That was a huge disappointment for us. Our greeting agent was very helpful with that. Thank you very much for your sharing your experience at Strachan Point. We are glad you enjoyed the property with the exception of the swimming pool. Since your stay was during our low season time period, the pool is still winterized and heated during the summer season period only. The rates in the low season reflect pricing due to seasonal restrictions on some of the amenities like the pool. Yes, we did get a few days of unseasonably warm weather during your stay, which was very nice for your stay, but the weather did change back to cooler weather not long after your check-out. We do advertise the pool is closed during the low season rental months. We are able to turn the heating on during the low season if the guest is willing to pay an extra fee to have it heated and remain heated during their low season period stay. Please speak with one of our reservation agents in the future if you wish to have a heated outdoor pool during the low season period. Thank you again for your comments, we hope to see you again soon. 1. The pool heater did not work. Therefore we were unable to use it in this climate. 2. Bed sheets were not on the beds. 3. The dishwasher was not working properly - it ran through the cycles, but dishes did not clean well. 4. The home did not have air conditioning, which was fine. However, the windows and doors did not have screens and the mosquitoes were able to enter the home. 5. Just a thought...it would be very nice to have had some game monopoly, checkers, chess, puzzles to enjoy with the children during our down times! Now, this list is very minor. We loved our stay! Thank you very much for sharing your experiences at Strachan Point. EMR Vacation Rentals did take up your comments about the pool, sheets and issues with the dishwasher with the owner. The pool heater was functional, however with an unusual cold month of July and the pool being deep and directly at the ocean it doesn't heat up to everyone's comfort. The dishwasher has been checked and it is working properly. We contacted the cleaning crew and they had not put on the flat sheets. However all duvet covers are washed after every stay so the beds were made up to European standard. Thank you again for your comments and we hope to see you again in the future.